On the eve of his Passion, during the Passover meal, the Lord took the bread in his hands - as we heard a short time ago in the Gospel passage - and, having blessed it, he broke it and gave it to his Disciples, saying: "Take this, this is my body". He then took the chalice, gave thanks and passed it to them and they all drank from it. He said: "This is my blood, the blood of the covenant, to be poured out on behalf of many" (Mk 14: 22-24). The entire history of God with humanity is recapitulated in these words. The past alone is not only referred to and interpreted, but the future is anticipated - the coming of the Kingdom of God into the world. What Jesus says are not simply words. What he says is an event, the central event of the history of the world and of our personal lives. These words are inexhaustible. In this hour, I would like to meditate with you on just one aspect. Jesus, as a sign of his presence, chose bread and wine. With each one of the two signs he gives himself completely, not only in part. The Risen One is not divided. He is a person who, through signs, comes near to us and unites himself to us. Each sign however, represents in its own way a particular aspect of his mystery and through its respective manifestation, wishes to speak to us so that we learn to understand the mystery of Jesus Christ a little better. 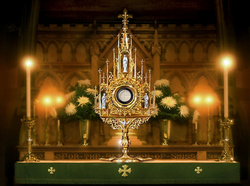 During the procession and in adoration we look at the consecrated Host, the most simple type of bread and nourishment, made only of a little flour and water. In this way, it appears as the food of the poor, those to whom the Lord made himself closest in the first place. The prayer with which the Church, during the liturgy of the Mass, consigns this bread to the Lord, qualifies it as fruit of the earth and the work of humans. It involves human labour, the daily work of those who till the soil, sow and harvest [the wheat] and, finally, prepare the bread. However, bread is not purely and simply what we produce, something made by us; it is fruit of the earth and therefore is also gift. We cannot take credit for the fact that the earth produces fruit; the Creator alone could have made it fertile. And now we too can expand a little on this prayer of the Church, saying: the bread is fruit of heaven and earth together. It implies the synergy of the forces of earth and the gifts from above, that is, of the sun and the rain. And water too, which we need to prepare the bread, cannot be produced by us. In a period in which desertification is spoken of and where we hear time and again the warning that man and beast risk dying of thirst in these waterless regions - in such a period we realize once again how great is the gift of water and of how we are unable to produce it ourselves. And so, looking closely at this little piece of white Host, this bread of the poor, appears to us as a synthesis of creation. Heaven and earth, too, like the activity and spirit of man, cooperate. The synergy of the forces that make the mystery of life and the existence of man possible on our poor planet come to meet us in all of their majestic grandeur. In this way we begin to understand why the Lord chooses this piece of bread to represent him. Creation, with all of its gifts, aspires above and beyond itself to something even greater. Over and above the synthesis of its own forces, above and beyond the synthesis also of nature and of spirit that, in some way, we detect in the piece of bread, creation is projected towards divinization, toward the holy wedding feast, toward unification with the Creator himself. And still, we have not yet explained in depth the message of this sign of bread. The Lord mentioned its deepest mystery on Palm Sunday, when some Greeks asked to see him. In his answer to this question is the phrase: "Truly, truly, I say to you, unless a grain of wheat falls into the earth and dies, it remains alone; but if it dies, it bears much fruit" (Jn 12: 24). Mediterranean culture, in the centuries before Christ, had a profound intuition of this mystery. Based on the experience of this death and rising they created myths of divinity which, dying and rising, gave new life. To them, the cycle of nature seemed like a divine promise in the midst of the darkness of suffering and death that we are faced with. In these myths, the soul of the human person, in a certain way, reached out toward that God made man, who, humiliated unto death on a cross, in this way opened the door of life to all of us. In bread and its making, man has understood it as a waiting period of nature, like a promise of nature that this would come to exist: the God that dies and in this way brings us to life. What was awaited in myths and that in the very grain of wheat is hidden like a sign of the hope of creation - this truly came about in Christ. Through his gratuitous suffering and death, he became bread for all of us, and with this living and certain hope. He accompanies us in all of our sufferings until death. The paths that he travels with us and through which he leads us to life are pathways of hope. Bread made of many grains contains also an event of union: the ground grain becoming bread is a process of unification. We ourselves, many as we are, must become one bread, one body, as St Paul says (cf. I Cor 10: 17). In this way the sign of bread becomes both hope and fulfilment. In the procession we follow this sign and in this way we follow Christ himself. And we ask of him: Guide us on the paths of our history! Show the Church and her Pastors again and again the right path! Look at suffering humanity, cautiously seeking a way through so much doubt; look upon the physical and mental hunger that torments it! Give men and women bread for body and soul! Give them work! Give them light! Give them yourself! Purify and sanctify all of us! Make us understand that only through participation in your Passion, through "yes" to the cross, to self-denial, to the purifications that you impose upon us, our lives can mature and arrive at true fulfilment. Gather us together from all corners of the earth. Unite your Church, unite wounded humanity! Give us your salvation! Amen.